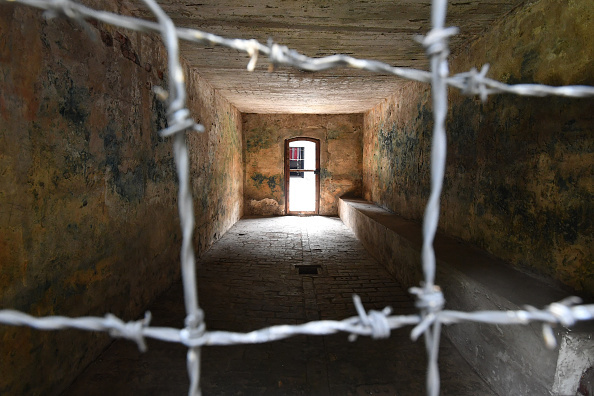 Organizations representing Holocaust survivors are protesting after discovering that Polish artists filmed a video inside a former Nazi concentration camp. These Jewish groups are demanding Poland explain the naked game of tag that was allowed to be filmed inside a gas chamber. The video, called “The Game of Tag,” was shot in 1999 by Artur Zmijewski. It was exhibited in 2015 at the Museum of Contemporary Art in Krakow as part of an exhibition called “Poland – Israel – Germany. The experience of Auschwitz,” which was sponsored by the Israeli Embassy in Poland, although the Israeli government objected to the film. The filming location was unknown until Prince William and Kate Middleton visited the Stuthoff camp in July. In the video, naked men and women file into the chamber and begin to play tag while laughing. The Organization of Holocaust Survivors in Israel and the Simon Wiesenthal Center sent a letter to the president of Poland, Anrzej Duda, asking if the filmmaker had gotten permission to film at Stutthof. They also asked the president to condemn the video. Israeli lawyer David Schonberg realized the video had been filmed in Stutthof on November 29th when he watched footage from William and Kate’s visit and recognized some of the chamber’s features. But Jewish officials found the video highly offensive. The World Jewish Congress and Israel’s Holocaust Memorial, Yad Vashem, asked the museum to remove the installation, saying that it is disrespectful and makes light of the Holocaust. Schonberg told the BBC that he was bothered by the indifferent reception to the video in Poland. "This is a problem that needs to be addressed," he said. "If people are not sufficiently sensitive to the terrible acts of the Holocaust and do not respect its victims then proper conduct in the sites in Poland cannot be secured." Stutthof was built by the Nazis in 1939, and 65,000 people died at the site, 29,000 of whom were Jewish.